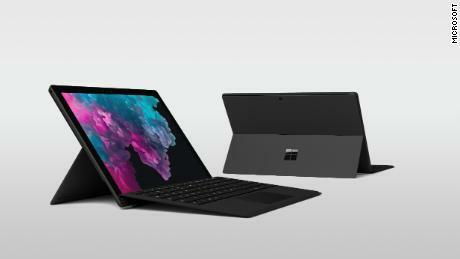 The first Surface desktop, an iMac competitor focused on creativity, was introduced in October 2016. Its successor, the Surface Studio 2, offers improved graphics performance and Microsoft says it’s the fastest Surface device ever made. It has a 28-inch display and USB-C support. It’s available for pre-order on Tuesday starting at $3,499. The Surface Headphones ($349) offer adjustable noise cancellation and automatic pause and play, which will stop the video you’re viewing when you take them off. Microsoft’s voice assistant Cortana is built in and can read your emails aloud or start a conference call. Surface Headphones will be available later this year. Meanwhile, Microsoft says the Surface Pro 6 is 67% faster than its predecessor but with the same battery life (up to 13.5 hours). Microsoft also says it’s easy to toggle between laptop, studio and tablet mode. It comes in black and platinum and starts at $899. The original Surface Pro in 2012 was marketed as a tablet. It looked kind of like an iPad, but with the addition of a keyboard cover. Microsoft (MSFT) has since shifted its pitch to a laptop with a touchscreen. This 2-in-1 format is aimed at people like doctors, pilots and students who need tablets for note-taking or reading, but a laptop for full functionality. The Surface Laptop 2 (starting at $999) comes with faster and quieter typing and up to 14.5 hours of battery life, according to Microsoft. 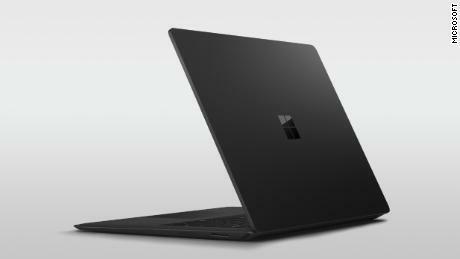 It’s 85% faster than its predecessor, and the Surface Laptop 2 comes in a new color (black), as well as the existing options burgundy, platinum and blue. “More and more, devices are permeating your whole life. We build these things to appeal for your work and personal life,” Yusuf Mehdi, Microsoft’s corporate VP of modern life and devices, told CNN. The company also unveiled its next-generation Windows software — called Windows 10 October 2018 Update — which has a focus on productivity. For example, the Your Phone App brings texts and photos from your Android phone to your PC. (Apple allows such an integration for its iMessage service.) You can also integrate a To-Do list with Outlook.com, and drag an item into an open slot on your calendar to block time to finish it. Microsoft’s main audience for these new devices is enterprise business professionals, according to Andrew Hewitt, an analyst at research firm Forrester. Ahead of Tuesday’s event, he noted Microsoft has heavily invested in productivity elements including Timeline, which lets you go back to where you left off on files and websites, and Focus Assistant, a feature that limits distractions like notifications.